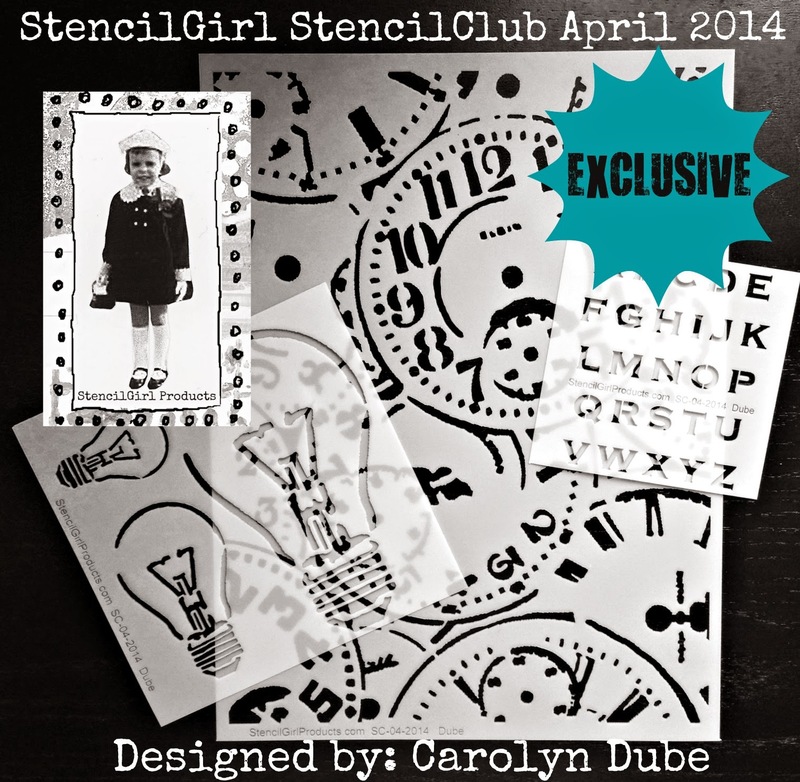 It is almost time for the StencilClub Stencils to arrive in Your mailbox! And then it is time for ART! and just played with it. and then decided to add the blue. Then another clock face was added to the other side. somewhere in the future I will be using these for dates in my Daily..
just to change things up a little! to commemorate the time change. Did anyone notice this little stand alone figure on the above left here? It totally peeked my interest when I noticed it. Maybe a chess piece? A balance scale? I settled on it for a border of flowers! and baked it in the little oven. The happy flowers were my favorite. If you want to find out how you can become a member of StencilClub, please visit the StencilGirl Products website HERE. I really love what youve done with Carolyn's fab stencils. Your doodling is amazing and that blue colour makes it all stand out so well. Janet, I love the black/white with blue! Stunning! Wow! Wow! Wow! All I can say is Wow!!! Janet you are amazing! I love how you nested the clock face. Are those also stencils? If so, can you share? Or maybe that is all your amazing doodling? Either way the two go together perfectly. Love it. All the clock faces are part of the stencil....that's how it comes! Are you in StencilClub? If so, you will be getting it in the mail! Always delightful seeing your journal pages, Janet! Love all your blues in these and the dynamic compositions you created with the clock faces! Super creative! I think you took this stencil to a whole new level - well done!